Tell me, is your ponytail looking a little sparse? Is your scalp a little more visible through your hair than it used to be? There are two things I need to ask you to do. First, don’t resign yourself to limp, lackluster, thinning hair. Second, don’t rush out and drop tons of money on expensive solutions and invasive procedures. Often, you just need to adjust your lifestyle. That can mean switching up your diet, hairstyling methods, or products. And in other cases, hair loss can be totally natural and temporary. Apple cider vinegar for hair growth. Better yet - simple, inexpensive, non-toxic hair growth you can take care of at home. I’m going to roll out 9 of the best ​​secrets to use apple cider vinegar for hair growth. With ​apple ​cider ​vinegar, hair doesn’t just grow; it’s healthier, softer, and stronger. To begin, let’s examine why your hair may be thinning out. Hairstyles that create tension. What’s your go-to ‘do? If so, that may be the cause behind your light pattern baldness. 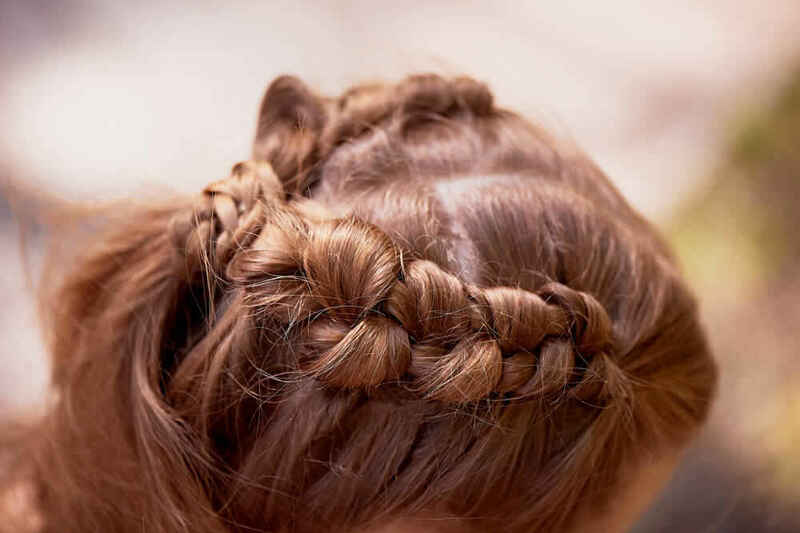 Recently, researchers at Johns Hopkins University found that tightly-wound hairstyles, when worn regularly, can cause traction alopecia. What particular styles can cause traction alopecia? For example, braids, dreadlocks, and tight buns and ponytails. Additionally, long-term use of hair extensions can cause hair loss. The moral of the story? If you want to save as many strands as you can, opt for styles that don’t pull on the scalp. An underlying medical condition. What lies at the root of your hair loss? It may be that you need to treat a medical condition before you will see regrowth. Hormonal imbalances, diabetes, and autoimmune diseases could be behind your loss. Polycystic ovarian syndrome, known as PCOS, can cause hair loss through the overproduction of androgens. This is known as androgenic alopecia. Additionally, the circulation problems caused by diabetes can inhibit proper blood flow to the scalp, causing extra shedding. Lastly, with autoimmune diseases, confused antibodies that attack your own healthy cells can result in hair loss. If you are experiencing any other symptoms along with hair loss, see your physician for a checkup and testing. Menopause. This could technically be another underlying condition involving a hormonal imbalance. However, menopause is a normal, natural part of the aging ​process. Fortunately, hair loss associated with menopause often happens at a slower, less perceptible rate compared to other causes. Like PCOS, menopausal hair loss occurs when male androgens become more dominant. Losing more than you bargained for? Because hormone replacement therapy may not stop hair loss, it’s important to check for other factors. The combination of menopause and a medical condition could be to blame if hair loss is sudden and noticeable. Restrictive diets. Diets low in calories and nutrients can impact hair health big time. In fact, this is likely the culprit in pre-menopausal women who are always on a diet. Interestingly, researchers notice that telogen effluvium (your hair’s resting phase) is more likely to occur in January. As you know, that’s around the time people crash diet to counteract holiday indulgences. ​Moreover, diets low in protein can lead to hair loss. That’s not so crazy when you consider that hair itself is made of protein. Instead of starving, aim to get at least 1500 calories a day. Make sure you’re eating a variety of foods that include fruit, veggies, and a good protein source. STRESS. Is your life firing on all cylinders? Never get a break? Feel like tearing your hair out? You may not need to, or maybe you already are and haven’t realized. There are three kinds of hair loss that can occur as a result of too much stress. First, good old telogen effluvium can come about under duress. Next, you have trichotillomania. Trichotillomania is a compulsion in which you pull strands out one at a time during tense moments. Finally, alopecia areata arises when the immune system becomes dysfunctional and attacks follicles. 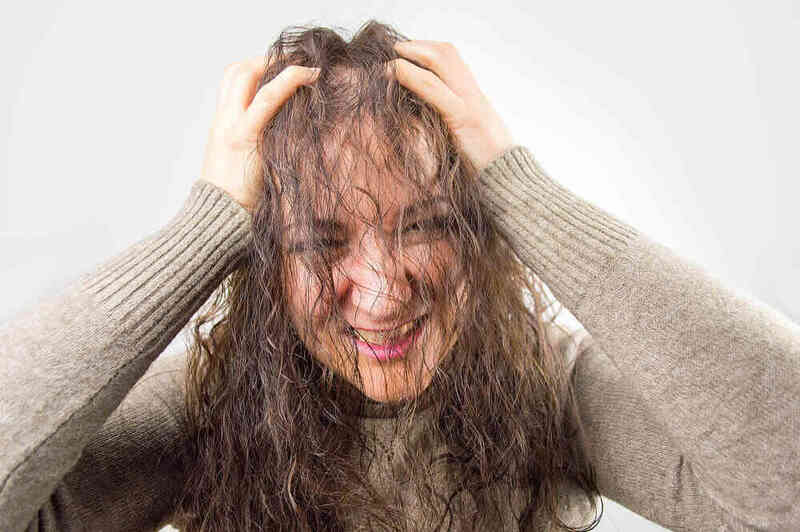 As soon as you get your stress levels under control, hair loss should stop. ​Are you ready to regrow? Then you must keep reading. ​So, are you ready to do something about your thinning hair? It’s time to find out how exactly apple cider vinegar can help you restore your hair to its former glory. 1. A deep, non-drying clean. If you ever use ACV or other vinegars to clean up around the house, this makes total sense to you. Apple cider vinegar helps dissolve residue left from heavy conditioners, gels, mousses, and oils. For starters, grimy scalps and sticky strands appear dull and limp. And when you do wash, you may notice more hair shed than normal. How many times has a giant clump of hair freaked you out in the shower? Yet, we don’t want to make hair too crispy and dehydrated with daily washings. The oils our scalp produces are a major contributor to healthy hair. Clarifying shampoos can strip these away completely. To clarify without making hair too dry, leave your ACV on for three minutes prior to rinsing. Later on, I’ll share the exact proportions to use. 2. Detangle without damage. While you’re babying your hair to encourage regrowth, remember that hair is most delicate when wet. Snagging your hair on a brush or comb will lead to extra loss. When dealing with wet hair, all you need is an apple cider vinegar solution and a wide-toothed comb - click for price. You see, not only is ACV a great cleanser, but it is very conditioning. In fact, some people skip shampoo and conditioner altogether in favor of ACV. Apple cider vinegar contains a range of B vitamins, including biotin, which is the go-to nutrient for hair growth. In addition to biotin, it contains the B vitamin pantothenic acid. Pantothenic acid is a hair-care must, which is why you’ll find variations of it many hair care products. 3. Clear up clogged follicles. Your follicles are actually organs in and of themselves. The hair bulb from which keratin (your hair) grows makes up the foundation of each tiny follicle. If follicles are blocked, guess what? The cells can’t divide and build upon one another to make a new strand. Clogged hair follicles can impede natural hair growth. But not to worry, clogged follicles are totally normal. In fact, most of it is just dead skin. You may ask, doesn’t washing with shampoo get rid of that stuff? No, not always. That’s because a lot of shampoos do nothing to treat the skin that makes up your scalp. Furthermore, many contain things like silicones which can contribute to clogging. 4. Maintain healthy pH balance. Lately, people have become more interested in the pH balance of their skincare products. Without proper pH balance, the growth of bacteria, both beneficial and bad, is thrown out of whack. It’s time that we apply this concern to haircare as well. The pH balance of your hair and scalp should fall somewhere between 4.5 and 5.5. Of course, it would be unreasonable to expect you to test strip every single product you buy. Take the guesswork out by balancing with ACV! Quality brands - click for price, of apple cider vinegar frequently test in the 4-5 pH level range. What are the benefits of pH-balancing your hair and scalp? Overall, it makes scalp conditions like dandruff and dry scalp less likely to occur. As we’ve learned, flaky buildup and dead cells can clog follicles and prevent regrowth. 5. Repel fungus and bacteria. We don’t wash our hair as much as we used to. On one hand, it’s great that we are saying no to chemical-heavy products that aren’t so great for hair health. On the other, fewer washings mean more opportunity for bacteria and fungus to take hold. ACV prevents infections and is naturally antibacterial. See prove here. 6. Improve scalp circulation for faster growth. Waiting for your hair to grow back is frustrating. Fortunately, impatient Rapunzels-in-waiting can use ACV internally and externally for accelerated hair growth. You see, one of apple cider vinegar’s biggest known uses is improved circulation. Taking daily shots of ACV diluted with water can stimulate blood flow to the scalp. 7. Improve porosity and restore the surface of each strand. Porosity refers to your hair’s ability to absorb moisture. For example, if you have low-porosity hair, your hair won’t soak up as much moisture. High-porosity hair can take in a lot of moisture, but has problems retaining it. You might be naturally predisposed to having a certain porosity, but that doesn’t mean it can’t be changed. Apple cider vinegar helps to smooth the cuticle, which we’ll discuss further in our next reason. This means that more moisture can be locked in, leading to healthier regrowth. Not sure what the porosity of your hair is? Perform a simple strand test. ​8. Fight frizz. Frizzy hair is more difficult to manage and style, leading to extra breakage. 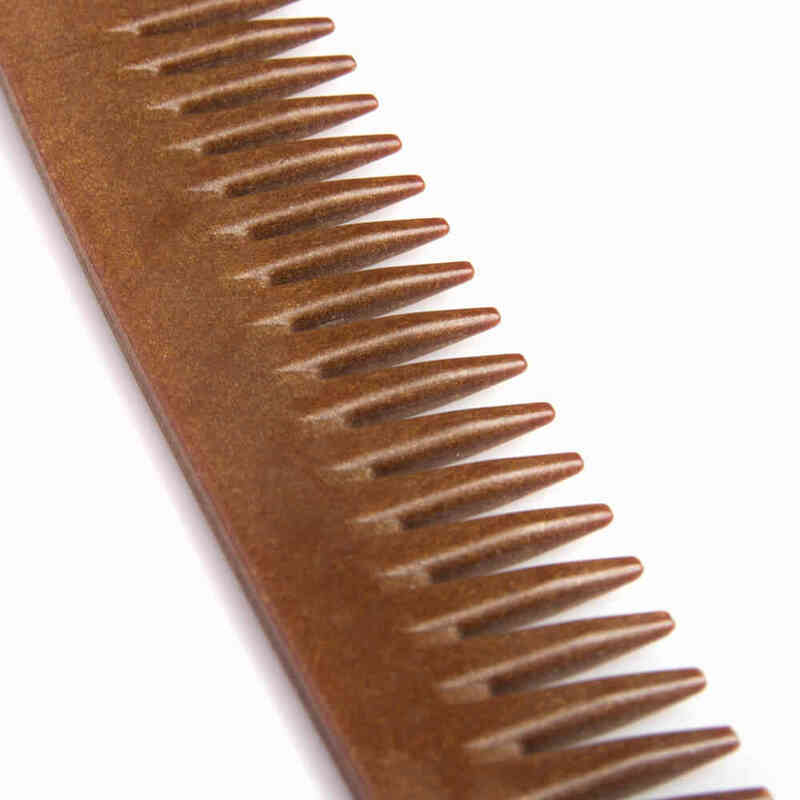 Once breakage occurs, there’s no solution except to trim off the frayed part and wait for it to grow back. ​While some of us have naturally frizzy hair, a pH imbalance can be to blame here. Disrupting the acid mantle of your strands leads to a rough cuticle that makes hair look messy. ​Regular ACV rinses smooth out the hair cuticle, improving porosity and restoring balance. That way, your hair won’t snag on brushes and combs and snap off in the first place. ​9. Get more volume and shine! Maybe you want to make the most of what hair you have left. Or, you want to be sure that your new growth is even better than what you lost. Either way, ACV’s the ticket. ​Once you smooth down the cuticle, your hair will be shinier, no question. But the cleansing and weightless conditioning ACV provides can also conceal thin spots. Fuller-looking hair can make that regrowth period much more tolerable. 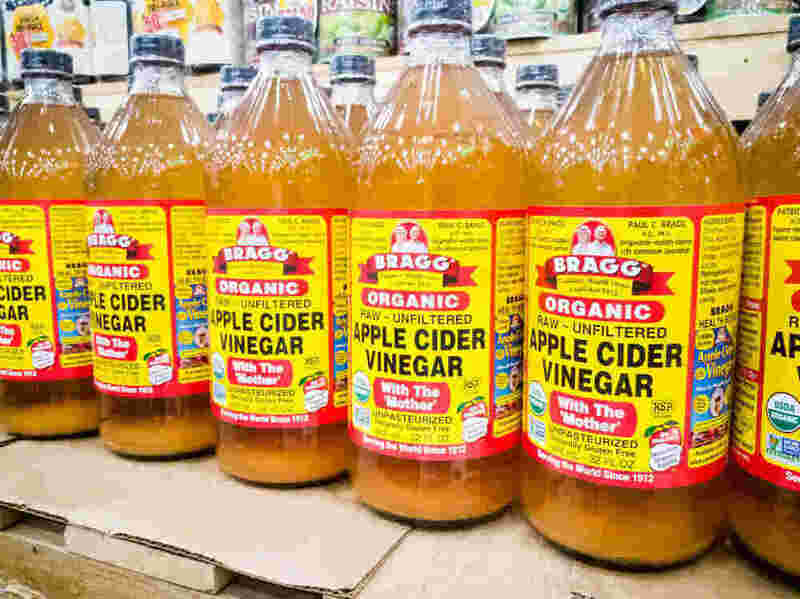 To begin, you need to buy an organic apple cider vinegar - click for price with the Mother inside. The Mother is the cobwebby substance that contains all of the proteins and enzymes your hair wants. 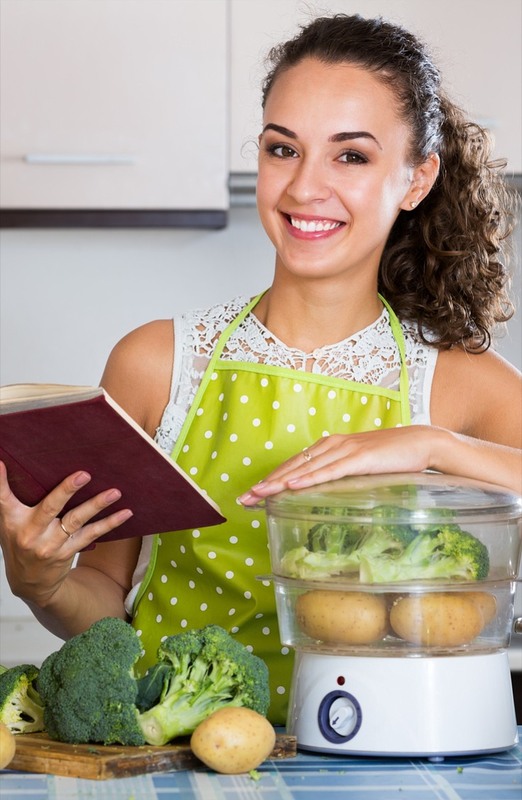 Next, use one of these recipes to grow gorgeous new hair. The Basic Weekly Treatment: First, combine two tablespoons of ACV with a cup and a half of distilled water. Double recipe for hair that is thick or approaches waist-length. Pour mixture into an empty spray bottle. Section hair off and spray hair thoroughly, taking care to saturate the scalp, mid-lengths, and ends. Once all of your hair is saturated, massage your scalp gently for extra stimulation. This will also ensure you didn’t miss a single strand. Allow to sit for three to five minutes and rinse. Follow up with conditioner if desired. ACV Hair Recipe for Dry Scalp and Dandruff: Mix water and apple cider vinegar as instructed above. Next, add a few natural ingredients targeted to improve scalp conditions. The most effective would be tea tree oil. Add several drops to your water and ACV mixture and apply with spray bottle. Take extra care with the scalp massage when focusing on scalp conditions. 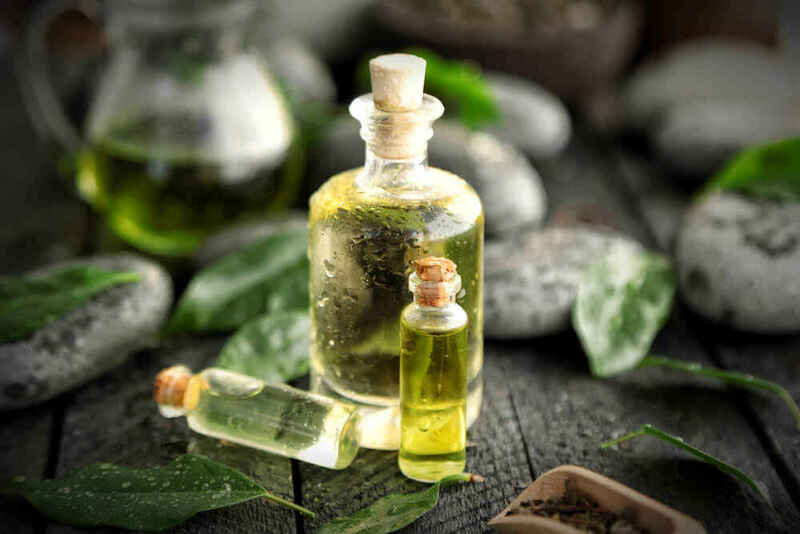 If you don’t have tea tree oil - cl​ick for price, you can use clary sage or lavender essential oils. Let sit for approximately five minutes, and rinse with warm water. ​The Ultimate ACV Conditioner: Pull out all of the stops and get super silky hair, a healthy scalp, and faster growth. This is not a general rinse, but a complete conditioning treatment. Therefore, you may have to adjust proportions to suit your particular amount of hair. Mix two tablespoons of ACV with one tablespoon of water. Next, add two tablespoons of melted coconut oil. Finally, stir in a drizzle of raw honey. If preferred, you can replace coconut oil with jojoba or olive oils. Also, feel free to add a drop or two of an essential oil like sandalwood. ​Apply to entire length of hair, comb through gently, and let sit for ten minutes. Rinse with cold water for even more shine. ​You have to be kinder to your hair if you don’t want to lose it! Rough treatment, hormonal imbalances, illness, stress, and dieting can show up on top of your head. Hair loss is depressing, but there’s something you can do about it. ​I want to know: why do you think your hair is falling out? Have you ever tried an apple cider vinegar rinse for growth? Be sure to share your experience, and don’t forget to try one of the remedies I offered you today!